Trust Auto has a wide selection of exceptional pre-owned vehicles to choose from, including this Loaded 2015 Chevrolet Silverado 3500 Heavy Duty Crew Cab 8FT Long Bed Pickup Truck Dually w/ 6.6L V8 Turbodisel & Allison Transmission. Only the CARFAX Buyback Guarantee can offer you the comfort of knowing you made the right purchase. Enjoy a higher level of satisfaction with a CARFAX one-owner vehicle. You deserve a vehicle designed for higher expectations. 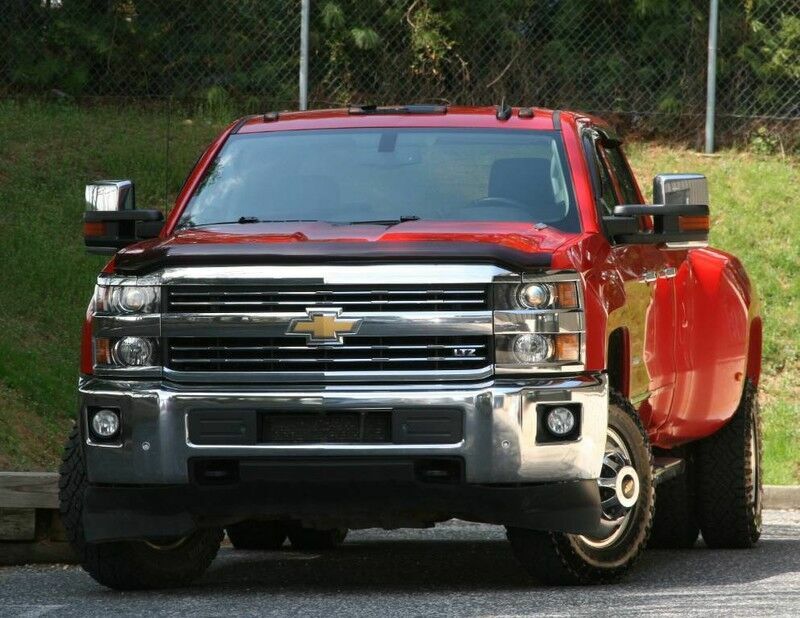 This Chevrolet Silverado 3500HD delivers with a luxurious, well-appointed interior and world-class engineering. With 4WD, you can take this 2015 Chevrolet Silverado 3500HD to places roads don't go. It's all about the adventure and getting the most enjoyment out of your new ride. Added comfort with contemporary style is the leather interior to heighten the quality and craftsmanship for the Chevrolet Silverado 3500HD How often was the oil changed? Were important service intervals taken care of? You'll have the records on this vehicles to know for sure. Adjectives like impeccable, spotless, and immaculate can be used to describe how clean this Chevrolet Silverado 3500HD LTZ is, causing it to feel more like a new vehicle than a pre-owned one. They say beauty is on the inside and once you experience the unbelievable options in this Chevrolet Silverado 3500HD, you'll agree that this is one beautiful vehicle. This vehicle comes with a navigation system. That doesn't mean you won't get lost. But it does mean you won't stay lost. No matter the season or weather conditions, the tires on this Chevrolet Silverado 3500HD can handle the job. More information about the 2015 Chevrolet Silverado 3500HD: The Silverado range is always one of GM's biggest sellers. This means GM is always endeavoring to innovate and continue to improve the truck's design. As a result, the consumer wins -- whether hauling equipment to a job site, working a farm or towing a boat, the Silverado 2500 and 3500 are built for tough work, and they are some of the best-designed trucks available from any manufacturer. Made in either short- or long-bed form, with two- or 4-wheel drive, optional dual rear wheels and with a choice of several impressively powerful engines, the Silverado can be set up do just about anything asked of it. The 2500, even simply configured, is capable of towing a massive load and base prices start around $31,000. Strengths of this model include available 4-wheel drive, Superior heavy-duty towing and hauling capability, wide variety of configurations, powerful engine lineup, and class-leading design *30 DAYS / 1000 MILES POWER-TRAIN WARRANTY INCLUDED (ENGINE, TRANSMISSION, DIFFERENTIALS)* *TRADE INS ARE WELCOME* Trust Auto is one of the top pre-owned vehicle dealer in Maryland. We provide quality vehicles of various makes and models with the most competitive prices in the region. Trust Auto is dedicated to make your vehicle shopping experience hassle free and straight forward. With that in mind we fully inspect, service and detail all cars in the lot. We are open 6 days a week now FOR YOU!!! Monday - Saturday 9am - 7pm. Some vehicle information and pricing may be unintentionally missing or inaccurate, and Trust Auto will endeavor to correct such discrepancies in a commercially reasonable manner after being notified of any errors. Pricing errors and listing errors are considered invalid and may not be honored at the sole discretion of Trust Auto. Prices subject to change without notice and do not include Title, License, Registration Fees, State or Local Taxes, $895 PDI & $299 Dealer Processing Fees. Please contact seller for vehicle availability. All vehicles with PDI are sold with a 30 day / 1,000 mile warranty! EPA mileage estimates are provided for comparison purposes only. Actual mileage may vary depending on driving conditions, driving habits, and vehicle maintenance. Mileage listings are estimates and are not necessarily accurate odometer readings.